This free driving school WordPress theme is designed especially for driving schools, driving instructors, online driving courses, road safety rules teaching classes and similar teaching and learning websites. It is the best option for people with minimum or no knowledge of WordPress and coding but still wants to craft out a beautiful and functional website that will serve their purpose in the most efficient way. It looks smart on varying screen sizes, thanks to its responsive layout. 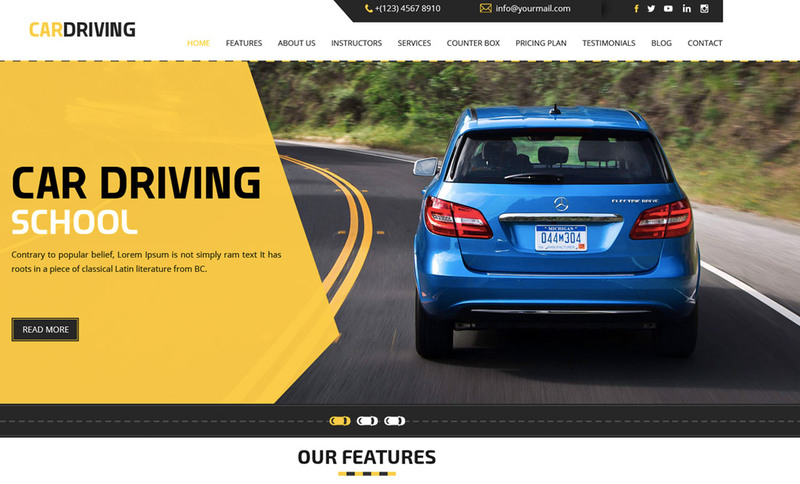 This free driving school WordPress theme is developed keeping in mind the diverse choices people have in matters as trivial as browser and hence it is made cross-browser compatible to load on various browsers. Serve wide range of demographics without any barrier as it is multilingual. Being a free theme, it does not come with any premium plugin but you can always extend its functionality with third party plugins. It is optimized for search engines to get a leading place for your website there. By adding social media icons, you can connect to maximum people and get an easy fame. The theme can be customized to change its logo and slider settings. The free driving school WP theme will help you set up the website without any glitches all because of fully explained documentation that is packed with it.